Halve Grapefruit: 1 medium to large grapefruit will clean your entire bath or shower from top to bottom, including all the fixtures. Simply cut the grapefruit in half. Sprinkle with Salt: Using 1 grapefruit half at a time, sprinkle liberally with salt. Wet your bathtub and sprinkle the remaining salt around the bottom. 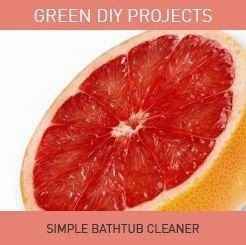 Time to Scrub: Scrub your grapefruit around your shower or tub, making sure to slightly “juice” the citrus over each fixture and lifting it every few seconds to pick up fresh salt from around the tub instead of just pushing it around. Rinse: When all is said and done, simply rinse away the pulpy bits and salt and your shower is as good as new. Not only is it clean, but it also smells fantastic! This technique will get thick grime and dirt rings off your shower area and does amazing work on cast iron tubs especially. You can also use this method to clean your sinks, toilets, tile and more! Grapefruit is featured in our Egyptian Fennel with Grapefruit and Sweet Orange Lip Balm, Brazilian Brown Sugar with Cocoa Butter Body Polish, and Chilean Rosehip with Tamanu and Red Clover Hand Cream. Click here to shop for these products.